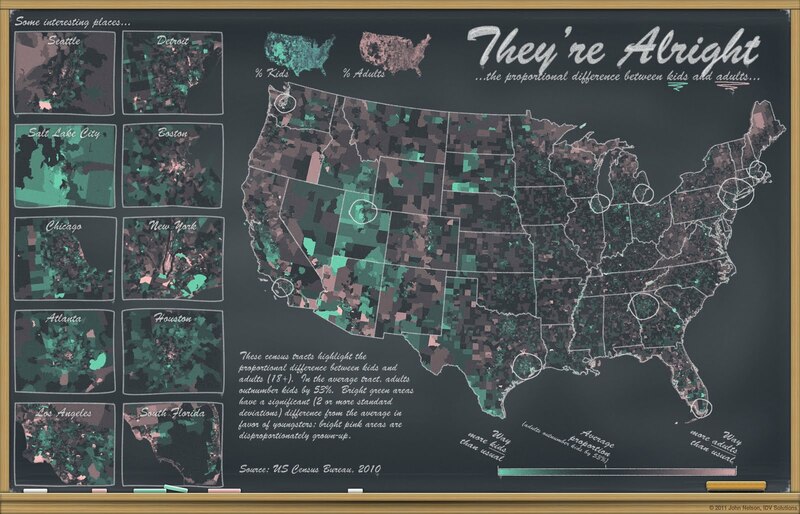 UXBlog | IDV Solutions' User Experience: Chalkboard Maps: Where are the Kids?! Data visualization at IDV Solutions. Chalkboard Maps: Where are the Kids?! Download the full-sized map here. This map presents the number of children (under 18) and the number of adults, compared to their average proportion. Did you know that, as far as census tracts go, adults outnumber kids by 53%? So using that as a baseline, pinker areas tend to be crammed with oldies while the greener areas are relatively youthful. What you get an immediate sense of is the location of families in the suburbs surrounding large cities; areas right downtown are bereft of local kids. At the national level there is a clear pattern of youthfulness around Utah-Arizona and within California's Central Valley. The Northeast's population is, in general, disproportionately low on kids. The characterization of the adults is an important factor to consider, as well. Some low-on-kids areas may be full of young professionals (dense urban areas, the Pacific Northwest) and others may be populated heavily with incoming retirees (South Florida, Phoenix), or it could just be an aging population with relatively few employment opportunities to keep or attract young families (Northern Michigan/Maine). Anyways, enjoy. And let me know your thoughts! © 2014 IDV Solutions. Powered by Blogger.